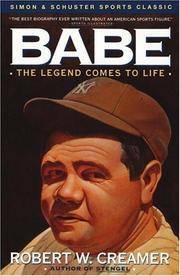 Babe Ruth is without a doubt the most famous character ever produced by the sport of baseball. A legendary player, world-famous for his hitting prowess, he transcended the sport to enter the mainstream of American life as an authentic folk hero. In this extraordinary biography, noted sportswriter Robert W. Creamer reveals the complex man behind the sports legend. From Ruth's early days in a Baltimore orphanage, to the glory days with the Yankees, to his later years, Creamer has drawn a classic portrait of an American original. Evanston IL: Holtzman Press, Inc, 1984. Fine. Two volumes, both reissued in the Sports Classic series, and each with a new introduction by Jerome Holtzman. Fine in red and blue leather patterned cloth, as issued. Each volume is Signed by its respective author. Although issued separately, these are housed together in a sympathetic custom slipcase commissioned by the New York Yankees, and has their interlocked "NY" logo on either side of the slipcase. Accompanied by a Christmas card from the Yankees, with the original envelope. All are fine, except the envelope which has tape shadows where the Yankees affixed the envelope on the package, effectively using the envelope as a mailing label. The Yankees issued these as Christmas gifts to the local newspaper "beat writers" who covered the team. 1974-09-01. New. Ships with Tracking Number! INTERNATIONAL WORLDWIDE Shipping available. Buy with confidence, excellent customer service! Simon & Schuster, 1974-08-15. Hardcover. Used:Good. 1992-05-08. Good. Ships with Tracking Number! INTERNATIONAL WORLDWIDE Shipping available. May not contain Access Codes or Supplements. May be ex-library. Shipping & Handling by region. Buy with confidence, excellent customer service! Simon & Schuster. PAPERBACK. 067176070X New Condition. . New. 1974-09-01. Good. Ships with Tracking Number! INTERNATIONAL WORLDWIDE Shipping available. May not contain Access Codes or Supplements. May be ex-library. Shipping & Handling by region. Buy with confidence, excellent customer service! Norwalk: The Easton Press, 1998. Leather bound. As new. Norwalk, CT: The Easton Press, c1998. 443pp., index, black and white frontis. drawing, black and white photographs. 8vo. Brown leather stamped in gold, raised bands, pictorial end papers, all edges gilt, ribbon marker. As new unread leatherbound hardcover. Simon &amp; Schuster, 1992. Paperback. New. 8.44 x 5.5 cm. Simon & Schuster, 1992-04-15. Second Edition. Paperback. New. New Paperback. From The Civil War Book Shop- As close as your computer; as dependable as old Abe. Simon & Schuster. PAPERBACK. 067176070X Like New Condition. . Fine. New York: Simon and Schuster, 1974. Well-regarded biography of baseball's best-known player. First edition, first printing, with full number string. Light wear to book, jacket shows minor edgewear with a few tiny tears, light creasing to head of spine.. First Edition. Hard Cover. Very Good/Very Good. Octavo. Pocket. Used - Good. Good condition. Stamped on inside. Evanston, IL: Holtzman Press, 1980. Reprint. Hardcover. Very good. Reissued by Jerome Holtzman (baseball writer for the Chicago Sun-Times). Signed on free endpaper by author, rest of text block tight and unmarked. Light shelf wear. Simon & Schuster, 1992-04-15. Paperback. Used:Good. Simon & Schuster. PAPERBACK. 067176070X Special order direct from the distributor . New. Simon & Schuster. PAPERBACK. 067176070X . New. Simon & Schuster. PAPERBACK. 067176070X Remainder mark . Fine. Simon & Schuster. Simon & Schuster 1974, Hardcover First Edition. Previous owner name on first page after free end page. Pages are clean and unmarked. Book Condition: Very Good Jacket Condition: Very Good . 1974. First Edition. HARDCOVER. Simon & Schuster, April 1992. Trade . 3 PB standard 50%. Simon & Schuster. PAPERBACK. 067176070X *LIKE NEW* Ships Same Day or Next! . Fine. Simon & Schuster. PAPERBACK. 067176070X *BRAND NEW* Ships Same Day or Next! . New. Simon & Schuster, 1974-08-15. Hardcover. Good. Simon & Schuster, 1992-04-15. Paperback. Good. U.S.A.: Simon & Schuster, 1992. Book. Very Good. Soft cover. 8vo - over 7¾ - 9¾" tall. Very-good condition soft cover book. Small remainder mark on top. No clippings. Covers are clean and bright, show light wear - no tears. Tight spine, clean pages. Illustrated. No writing or tears inside book. .
SIMON & SCHUSTER. GOOD CONDITION. TRADE PAPERBACK. Simon & Schuster. Used - Acceptable. Ships from Reno, NV. Former Library book. Shows definite wear, and perhaps considerable marking on inside. 100% Money Back Guarantee. Shipped to over one million happy customers. Your purchase benefits world literacy! Simon & Schuster. Used - Good. Shows some signs of wear, and may have some markings on the inside. Pocket. Used - Acceptable. Acceptable condition. Simon & Schuster. Used - Acceptable. Acceptable condition. Former Library book. Rebound as hardcover. Simon & Schuster. Used - Good. Good condition. Slightly dampstained. Simon & Schuster. Hardcover. 0671217704 Ships promptly from Texas. . Fair. 1974. Old Tappan, New Jersey, U.S.A.: Old Tappan, New Jersey, U.S.A.: Fireside, 1992, 1992. Paperback. VG-. 443pp. Index, Illus. Yellowing interior, rubbing wraps.. Paperback. VG-. Simon & Schuster. Very Good. 1992. Trade paperback. 067176070x . 8.20 X 5.40 X 1.20 inches . Simon & Schuster. PAPERBACK. 067176070X No CD Included. Access code may be previously used. Light dirt, wear, fading or curling of cover or spine. Good Binding. Minimal, if any highlighting or writing. Cover has used book stickers or residue. . Very Good. 1992. Simon & Schuster. PAPERBACK. 067176070X . Good. Simon & Schuster, 1992. Paperback. Acceptable. Disclaimer:A readable copy. All pages are intact, and the cover is intact. Pages can include considerable notes-in pen or highlighter-but the notes cannot obscure the text. At ThriftBooks, our motto is: Read More, Spend Less.Dust jacket quality is not guaranteed. Simon & Schuster, 1992. Paperback. Good. Disclaimer:A copy that has been read, but remains in clean condition. All pages are intact, and the cover is intact. The spine may show signs of wear. Pages can include limited notes and highlighting, and the copy can include previous owner inscriptions. At ThriftBooks, our motto is: Read More, Spend Less.Dust jacket quality is not guaranteed. Simon & Schuster. Used - Very Good. 1992. Paperback. Very Good. New York, New York, U.S.A.: Pocket Books, 1976. Book. Very Good. Paperback. excellent condition with slight yellowing, mild edge wear, name written on page edge and 1st page...thanks!. Simon & Schuster. PAPERBACK. 067176070X Item in good condition. Textbooks may not include supplemental items i.e. CDs, access codes etc... . Good.